You never know where when, why and how things will come to you but this item was just one of those items that came to me as I was looking through a magazine on historical projects that might help students before testing. Therefore I looked through the internet and expanded this review item before I made it public after trying it with my own students. 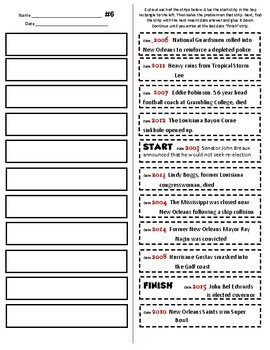 I used our own textbooks, magazines and the internet to create these timelines. 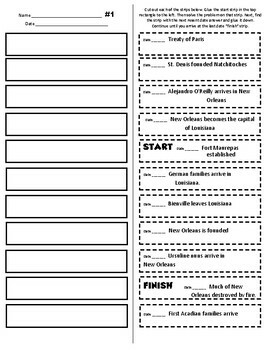 Allow students to use any source them want to complete these timelines but only allow them a set amount of time per timeline. I wanted mine to get better and learn the stress of test taking and its limited time. As I pulled items from textbooks it was easy but as I used magazines and other sources it became harder to keep the dates factual and some showed different dates. I have also included sheets for your own facts. 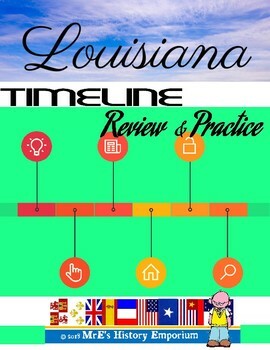 For backup of the timeline facts I used http://www.ereferencedesk.com/resources/state-history-timeline/louisiana.html just help keep the facts in order and to make the timelines easier to piece together. 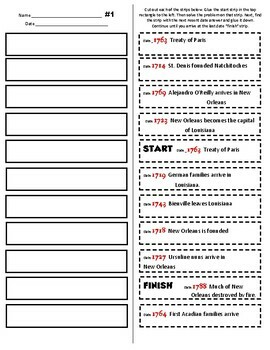 These timelines run thru centuries to the entire history of Louisiana.